Ancient yet modern, classic yet contemporary, masculine yet feminine, textural, whimsical. The adjectives go on, and so could I about fluting. I've developed a fond appreciation for all of the qualities that fluting adds to architecture and design. 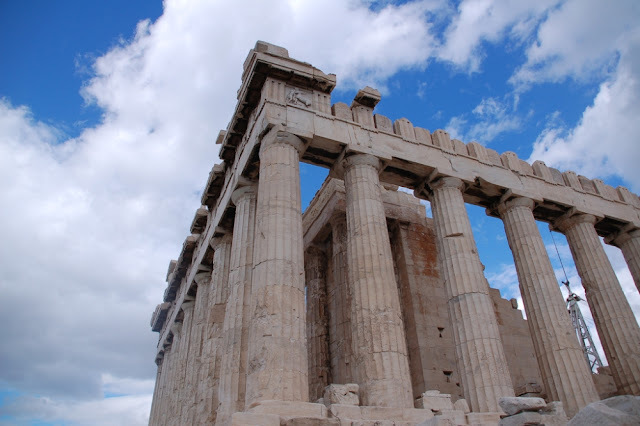 The pictures above and below of the Parthenon in Greece highlight both the beauty and timelessness of fluting as a pattern and element of design. You so often hear about how critical of a role that texture plays in neutral color schemes. The texture is the visual interest that breaks things up and softens, what could otherwise be, a harsh monochromatic palette. This is brilliantly displayed in the following designs. What better way to start off than to showcase a rather popular room in a house designed by McAlpine Tankersley. 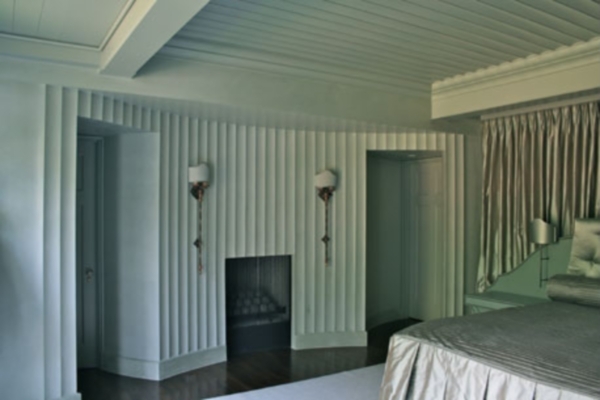 The half wall running across the back of this room has a fluted surface that adds bold texture to the palette of mostly white and creme colored furnishings. 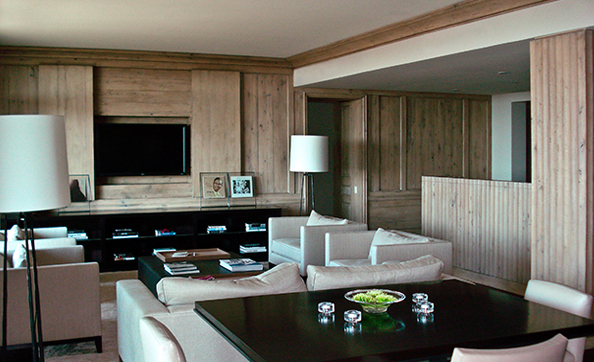 The wall is used to partition a very large room (60 feet long with 14 foot ceilings) into separate living areas. If you look closely, you'll notice the large-scale urns echo the fluting on the wall. 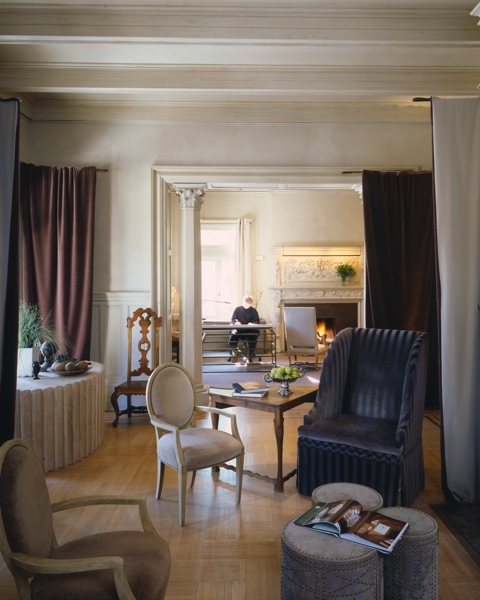 A room in a house designed by architect Ruard Veltman really accentuates the fluting. Notice the ceiling is fluted too, mirroring that of the fireplace wall. Fluting shows up regularly in Ruard's designs and he's quite genius about the unique ways he uses it to apply texture. I recently had the distinct pleasure of speaking with Ruard at an impromptu visit to his office in Charlotte (more on that later) and during our conversation he mentioned that the fluting on the fireplace wall was achieved with plaster. We didn't discuss the ceiling, but I suspect it was done with machined wood. Ruard also mentioned some other applications of fluting that he has in design. I won't spoil the surprise, we'll have to wait until the houses are built and photographed. Notice anything else in this room? There are fire balls in the fireplace. Another design favorite. 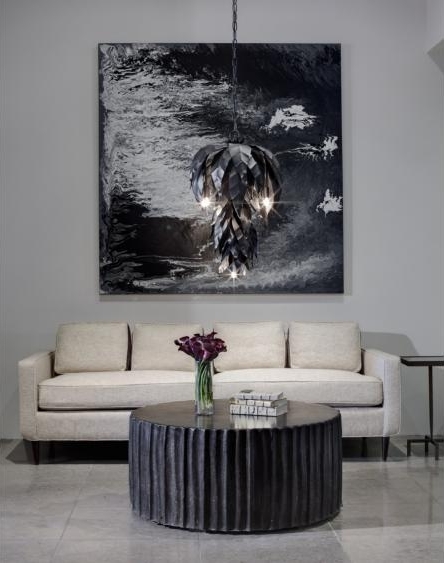 A recent article in Atlanta Homes & Lifestyles showcased the beautiful collaboration between architects Thomas Paul Bates and Jeremy Corkern of Bates Corkern Studio and designer Betsy Brown, both of which I've become quite enamored with the work of. Fluting makes a dramatic display in this mid-rise building in Birmingham. 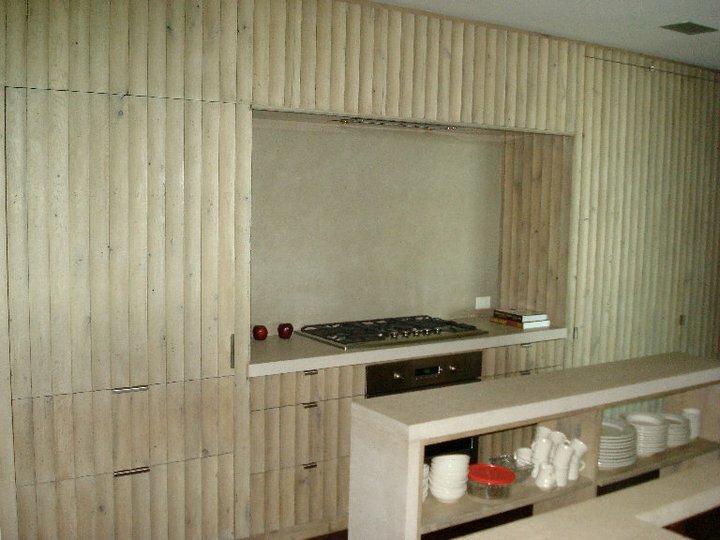 Fluted paneling is used on the walls leading to the kitchen and used to cover the cabinetry throughout the kitchen. 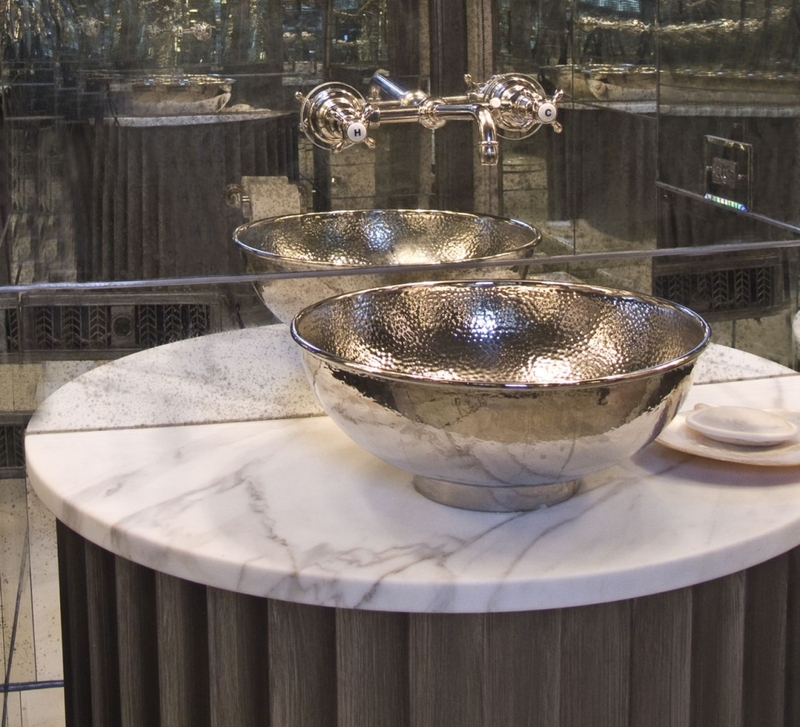 Both whimsical and textural, this fluted onyx tub enclosure captures your attention in a bathroom designed by architect William Hefner. I find this design to be quite creative and intriguing in a world where so many bathrooms seem the same. 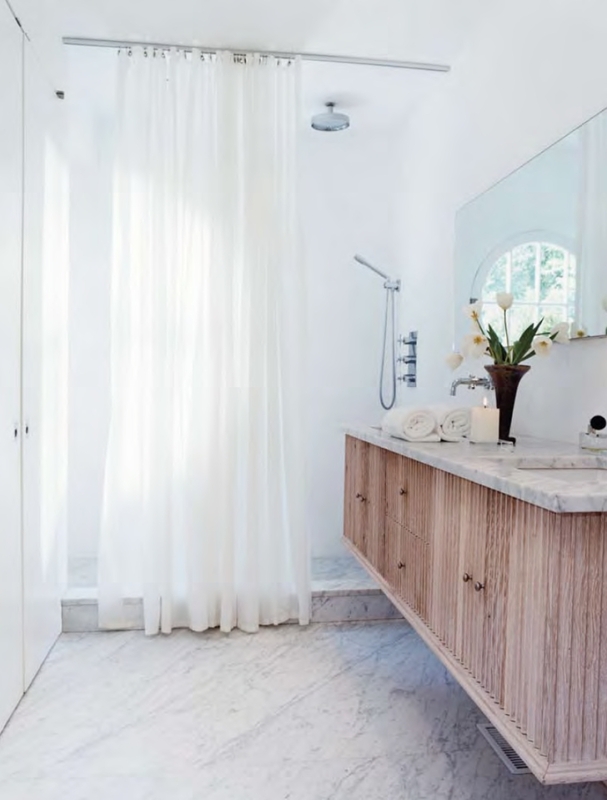 Speaking of bathrooms, designer Betsy Brown used fluted wood on the cantilevered vanity in the master bath in her home that she renovated with the help of Bates Corkern Studio. Clearly these folks need to keep collaborating. Their teaming yields great design. As a side note, I discovered that Betsy's house will be on a home tour in Birmingham in December. I will not be missing that. A road trip to Birmingham for some architectural tourism is way overdue. Fluting can be applied to not just wood and plaster, but metal too as seen in this kitchen designed by Pursley Architecture. Keeping the stainless steel flat wouldn't have been nearly as visually striking as this fluted design. Another fluted design by Ken Pursley in the form of a demilune vanity. Look closely and you can get a larger view of the vanity in the reflection of the mirror. The heather gray wood is a perfect complement to the gray veining of the marble. 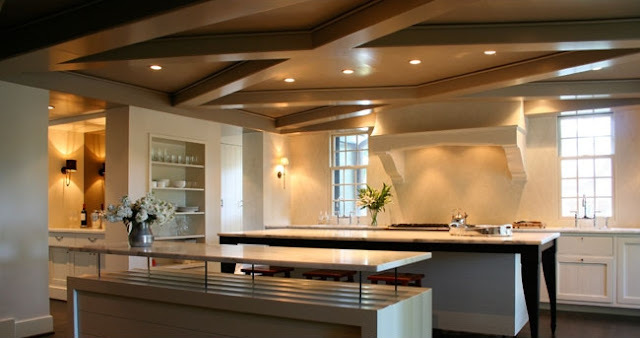 The distinct island in the foreground of this kitchen features a fluted surface along the top and down the sides of the base. It's hard to see this detail, but if you look closely, you'll see the shadows cast by the concave grooves. Architecture by Ruard Veltman. Fluting is often used in furniture design too, as illustrated in this beautiful room by Melanie Turner. The Barbara Barry table between the tufted chairs features a fluted band. Despite the limited color in this room's palette, it shines because of the textural variety among the tufting, fluting and hide upholstery. 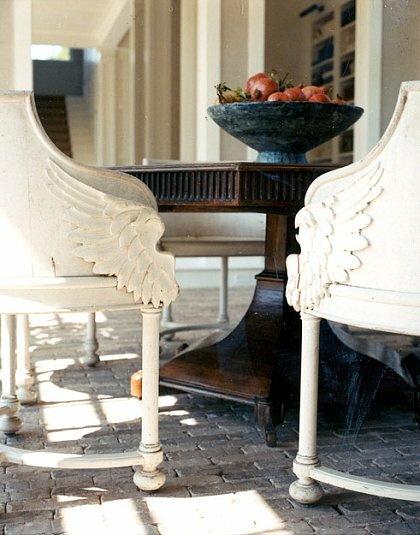 Photo via Atlanta Homes & Lifestyles, May 2005 by Erica George Dines. Another style of fluting in furniture design is highlighted in the band around the top of this table. Design by Haynes Roberts. 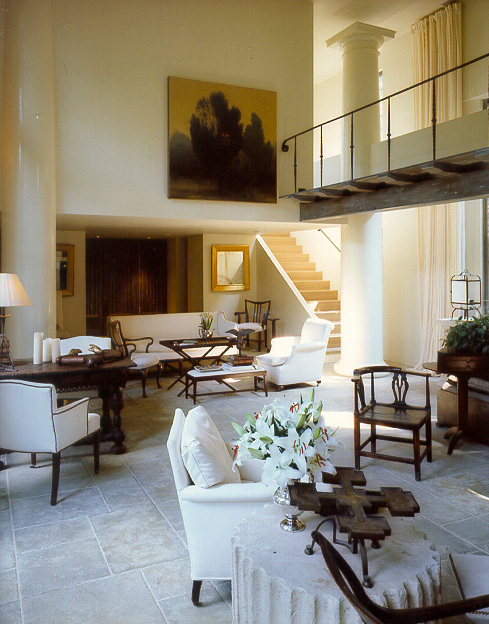 Coming full circle, a picture of Bobby McAlpine's former personal residence features a fluted side table. The table looked to me to be an architectural fragment of a piece of a stone doric column. I could only imagine how heavy that might be. Greg Tankersley informed me, however, that this table was made of cast concrete and designed by their firm. Apparently, there were several tables made of the cast concrete. I have noticed the table showing up in a number of McAlpine Tankersley designs, including the former office shown above. My understanding is that a collaboration with Elegant Earth is underway to produce similar designs from concrete. A more organic, and one might say contemporary, design by Bradley Hughes showcases yet another visually striking example of fluting in furniture design. Evocative of the natural beauty of trees, it hearkens back to what Vitruvius described as being the inspiration for fluting in classical architecture. The unique table is fashioned out of concrete and can be customized in color and dimension. I'll conclude this post with one of the most unique examples of fluting that I've come across. The sofa pictured above sits along a common area overlooking a firepit at Alys Beach in Florida. 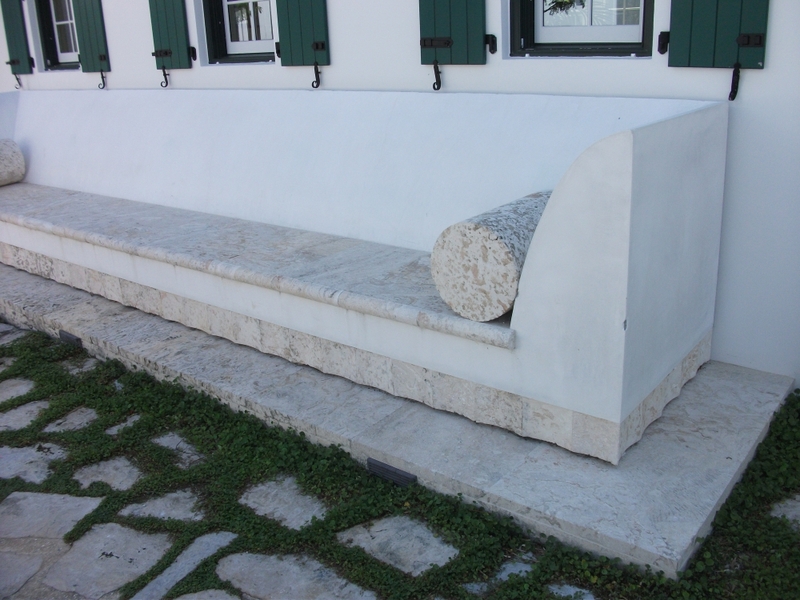 The sofa was crafted from concrete and stone. Notice the fluted band of stone along the bottom of the sofa. It lends the appearance of a slipcover. The bolster pillows made of out of stone were also particularly interesting. When I browsed through my photo collection looking for pictures for this post I realized how prolific fluting is in furniture design. It shows up everywhere from paneling, to banding, to lamp bodies and more. 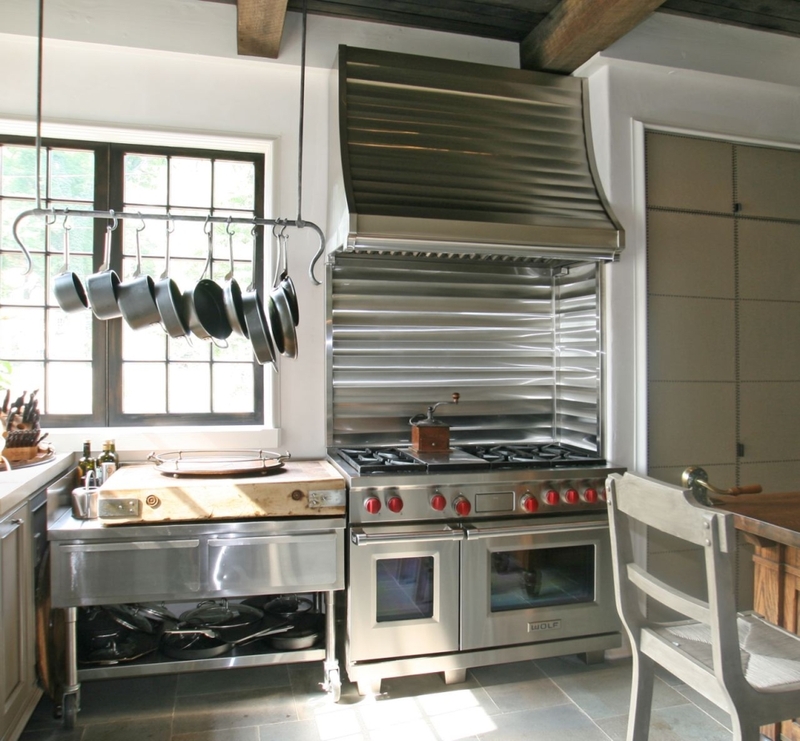 I particularly like how something so old and classic is constantly being reinvented and reinterpreted in new ways. A design that is truly timeless. Thank you to the architects who graciously provided me with photos for this post. This post is perhaps one of the best of the year! Bloggers take notice!!! Quite a good visual display to make the explanation of fluting interesting and timely. You don't post often, but when you do it is sublime. I learn something new and see things differently every time! I have fluting on the cabinetry in my master bathroom, and I will appreciate it anew now that I know more about it. I have truly missed hearing your voice! 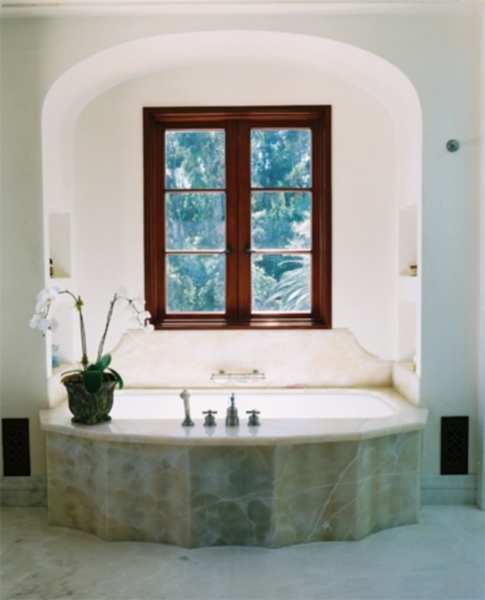 This post is so interesting and showcases many of the architects and designers I am drawn to. Thanks for opeing my eyes to some great detail. I look forward to your next post. Thanks for including our work in the post. Nicely done. 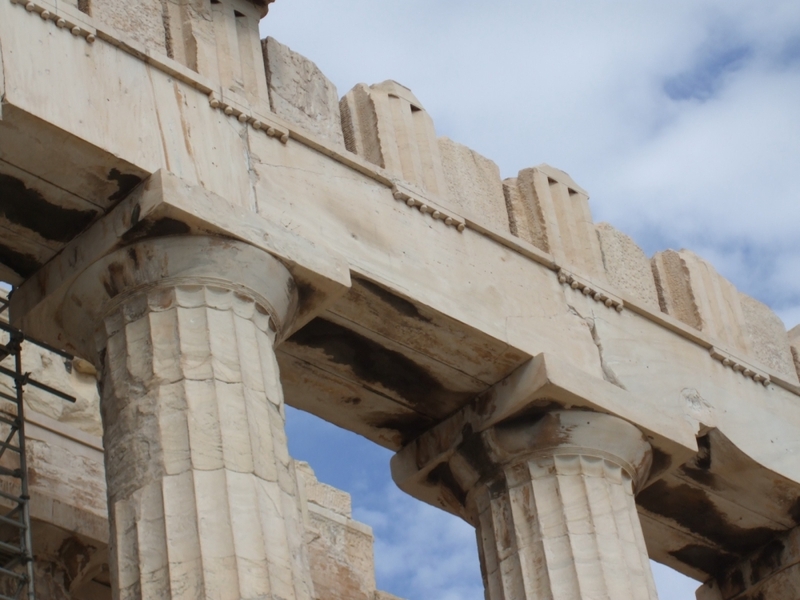 The enduring design details usually have a practical antecedent or basis in nature. Fluting made me think of scallop shells and the folds of curtains. Betsy Brown's vanity echos the shower curtain. Anyway, your post is making me look and think. "Tables made of the cast concrete" that look like column sections - yeah. You've been greatly missed! I missed Bobby McAlpine by a hair in Jackson MS, I mean a hair! Thanks for this gorgeous post, it lifted my day to read it! This post is so interesting and showcases many of the architects and designers. Thank you for sharing, my families and I all like you article, reading you article is our best love. Very interesting! I guess this must be my style because I LOVE every picture... that kitchen especially blew my mind!